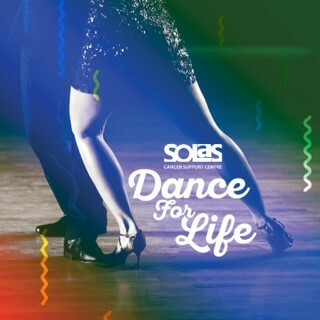 Following the amazing success of Dance for Life 2018, the Solas Cancer Support Centre is delighted to announce the event will be returning in 2019. Application forms are now available should prospective dancers like to apply. Tracy McDaid, Manager of the Solas Cancer Support Centre explains more: ‘To kick off 2019 we are looking for participants to undertake a 12 week training programme, staring in early January. The event is open to couples and also individuals who will be partnered with another dancer by our choreographer. Dances taught will include – Charleston, Disco, Salsa, Waltz, Jive to name a few! No previous dancing experience is required and all ages (over 16) and fitness levels are welcome to apply. Individual training sessions will take place on Tuesday and Thursday nights. Each couple will be designated a time-slot on one of these nights. Group dance session is on a Sunday night. This is a very exciting event that will help fund the activities and services that will be provided by the Solas Cancer Support Centre in 2019. Participants will be asked to fundraise €500.00 and we will offer as much support as possible to the dancers in their fundraising endeavours. There is no obligation to sell tickets. The closing date for applications is 30th November.